Rump is a Whitney Awards finalist in the Middle Grade category. 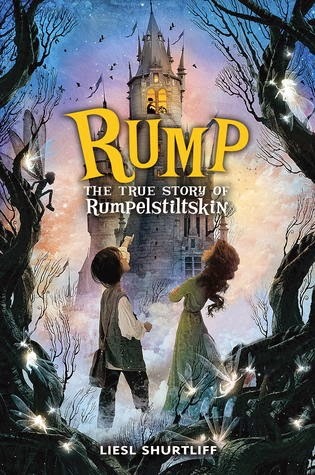 This retelling of the story of Rumpelstiltskin is inventive, amusing, and far more sympathetic to the eponymous character than I'd thought possible. I love these alternate-perspective tales where the story is told from a completely different angle! Rump is an orphan. His mother died giving birth to him, and he's lived in near poverty with his Granny ever since. The village in which they live is overseen by a miller named Oswald. Oswald demands that all the villagers, including children like Rump, work mining, digging, and panning for gold in order to trade with him for food and other necessities. On Rump's twelfth birthday, however, things start to change. He discovers his mother's old spinning wheel, makes friends with one of the village girls, Red, and his grandmother becomes very ill. Rump learns that he has some surprising magical abilities, but that they can be uncontrollable and more trouble than they are worth. As Red warns him, "All magic has consequences, Rump. Even small magic can have big consequences." Rump is kind-hearted and, even though it puts him at risk, goes to help the miller's daughter when she's in over her head through no fault of her own. The miller's sons, Frederick and Bruno, bully Rump throughout the story, leading Rump to the realization that "I didn't think meanness was ever in anyone's destiny. Meanness was a choice." There were a few less-than-smooth transitions and a couple of awkward holes in the plot, but Rump is really an enjoyable and engaging first novel from Shurtliff. I look forward to seeing more from her in the future.